Families Rule at Monarch Mountain, Ski Town Condos preferred lodging choice for Monarch Mountain. Ski Town Condos Vacation Rentals, 3 miles to Monarch Mountain, are the preferred lodging choice for families, especially with Monarch's new "Family Packages"! *ten or more ticket pricing: $40 adult (16-61), $32 teen (13-15), $17 children (7-12) directly with Monarch Mountain. Ski Town Condos are just 3 miles to the ski area! With 3 condos total, you will have the space each family needs. Each condo has 2 bedrooms, full kitchen, log beds, down comforters, limited wi-fi, and a hot tub in the gazebo! After a fun day on the slopes, kids & parents enjoy sledding & making snow angels in the snow around Ski Town Condos till the sun goes down. - Dec 30 - Jan 4, 2014, Czech Republic Gigi, We had a wonderful time staying in your condo. The kids especially loved the bunk bed. 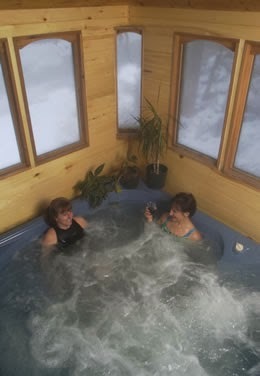 We all so much enjoyed skiing and soaking in hot tub in the evenings. Thanks for providing a neat place to stay. Hana J. Family from Czeck Republic. - Dec 24 - Dec 29, 2013, West Africa; Topeka, KS; Manhattan, KS; Grapevine, TX; Andover, KS Gigi, Thank you for your hospitality. Everything was perfect. We enjoyed the skiing, the hot tub, and the sledding. It was beautiful weather and perfect to spend Christmas together as a family. - Dec 21 - 24, 2013, Throckmorton, TX The K. Clan from Throckmorton, TX, loved Ski Town Condos. Definitely a home away from home. You are a true blessing Gigi! Thanks for Everything! Call today to make your Family Colorado Ski Vacation at 719-539-7928 or visit www.skitowncondos.com.